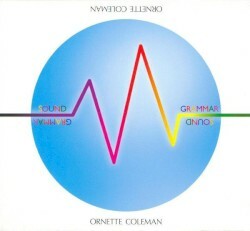 You never know quite what to expect from an Ornette Coleman record, even after all these years. Though if you've seen him in concert in the last couple of years, you'll have some idea; this wonderful disc is a record of his most recent band, recorded live in Germany in 2005. The line up of two basses (Greg Cohen and Tony Falanga) and drums (the ever present Denardo Coleman) is an echo of the Charlie Haden/David Izenson/Charles Moffat quartet that toured in the 1960s. It's certainly a far cry from the dense hyperactive scribble of Prime Time, and more than a little reminiscent of the open, airy explorations of the classic At The Golden Circle albums. The material is mostly new, though some pieces sound familiar. "Sleep Talking" (which may or not be related to an earlier tune calles "Sleep Walking") has a dolorous, achingly beautiful melody that sounds like it might have been around forever, just waiting for Ornette to pluck it out of the air. Ornette's alto remains one of the most recognisable sounds on the planet. Throughout this performance he sends out a continuous stream of melody. Not that this is news of course; that's what he's always done. But here (unlike Prime TIme) he's given more space to breathe, and the results are frequently jawdroppingly beautiful. Coleman's trumpet playing has always remained a bit of a mystery to me, but his occasional bursts of sawed violin give a nicely visceral thrill. Cohen's warm yet urgent pizzicato thrums lock with Denardo's fractured swing, while Falanga's bowed lines shadow the leader's swoops and flurries, breaking off into luscious, spicy microtonal glisses. Whether Cohen and Falanga understand Ornette's Harmolodic theory anymore than anyone else, I can't say; but that this lineup is the best expression of Coleman's muse for some years is (for me anyway) beyond doubt. Beauty is a rare thing indeed.